First up are Machinae Supremacy. Taking the stage not long after the venue doors opened, they play to an unsurprisingly small crowd although this grows steadily during their very short set. Hailing from Sweden the band have a strong electronic feel in some of their music, but live this is less prominent and they feel a lot heavier. Machinae Supremacy got the night off to a good start. Next up though were Ensiferum, a Finnish folk metal band, who in my opinion blew Machinae Supremacy away. 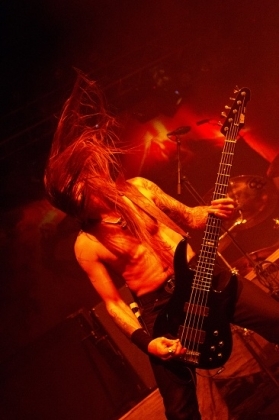 Ensiferum are great fun to watch, particularly bassist Sammi Hinkka who runs around like a lunatic in his kilt. All the band are headbanging and windmill frequently, and really know how to get the crowd going - there was lots of applause for their performance and plenty of fists and horns in the air as well. As with Machinae Supremacy, Ensiferum get a short set (the downside of having four good bands on the bill), despite this they still manage to give us a setlist with songs from most of their albums, ranging from "Token of time" from their 2001 debut album, to "From afar" and "Twilight tavern" from their 2009 album, From Afar. Guitarist Petri Lindoos tells the crowd that tonight is the birthday of their keyboard player (Emmi Silvennoinen), and gets the crowd to sing happy birthday to her. If you're a fan of bands such as Korpiklaani then Ensiferum are a band you should definitely check out. After Ensiferum finish their set, their backdrop is replaced by Amon Amarth's Sultur Rising backdrop and the crowd cheer approvingly. Its clear that Amon Amarth have attracted a lot of fans tonight - possibly as many as Children of Bodom themselves judging by the crowd. Amon Amarth come on stage bathed in orange light, which coupled with the backdrop has a very fiery volcanic feel. The band kick off with "War of the gods" from their new album (Sultur rising) and accompany Johan Hegg's powerful growly vocals with some powerful music and plenty of headbanging. The entire set is greeted with rapturous applause, but "Guardians of Asgaard" and "Twilight of the thunder god" from the bands 2008 album "Twilight of the thunder god", seem to be particularly popular with the crowd. Hopefully it wont be long before Amon Amarth are back here on tour, but as a Headliner rather than a support band so we can get a full length set. Tonights headliner is Children of Bodom. Like Amon Amarth, they kick off with a song from their new album (2011's "Relentless Reckless Forever") - "Not my funeral" being the track they chose to open the show. As well as this song, we're treated to three more tracks from the new album, all of which go down very well with the crowd. The stage looks great with tattered banners hanging overhead, great looking lighting and an impressive backdrop. 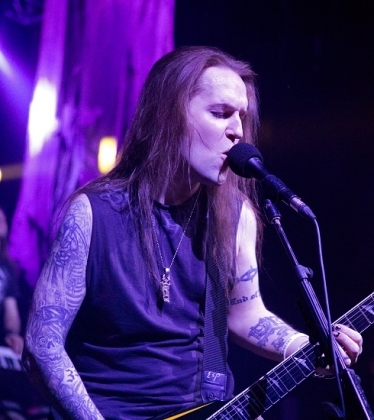 Alexi Laiho's guitar work is always impressive and tonight is no exception. Sadly he still has the habit when talking to the crowd of making half the words expletives - making him sound like a naughty child trying to shock. Despite this, Children of Bodom put in an excellent performance tonight and the crowd clearly enjoy their show. "Was it worth it" and "Hate crew deathroll" form the encore to end a great night of metal in London.